Seems Secretary of State John Kerry flubs on the mic almost as much as Vice President Joe Biden. But the difference is, Kerry might have stumbled into a way that forces the hand of the Obama administration thus preventing the U.S. involvement in Syria. More details at the NY Times article. Many may remember the line used and abused by the right when Kerry said “I was for the war before I was against it” referring to Iraq. Now it looks like he may have to change his mind again as Russia tries to call his bluff. « Is there a Social Media Posting Frequency Sweet Spot? Bringing us back all the way to 2004! I can’t believe it’s been almost 10 years. Do you remember who the key speaker was at the Democratic Convention that year? He gave a great speech. One that was inspiring. What happened to that guy? Decisions, decisions…pepperoni or mushroom? Leaded or unleaded? Get involved in war or stay home and spend the money on something useful? Let’s put that money into education of our future leaders. Our schools could sure use that funding. I am all for education…just not educating leaders like our current ones in both parties. Uneducated leaders aren’t so great either, though. I think our country needs a lotta straightening out before we go interfering in other matters. Restructuring is definitely called for. Great job on Kerry’s caricature. I knew it was him as soon as I saw it. Caricature??? I thought it was a photograph. Love your take on John Kerry! It is amazing though how the dove has turned into the hawk. I have my opinion on this but not being an American I will reserve the right to keep it to myself as things like this can be very controversial & complex matters. I’ve never heard of this bloke but it’s a great caricature Bearman. Good point. OK I will Google him for a pic. Wait a moment please. I Googled, viewed & compared. Now that I’ve seen him I can categorically state that your caricature is incredible . Malcolm (McDowell) wasn’t in the middle either. I have heard of the bloke. I would like for us to stay out of wars where we only help people who hate us and give weapons to people who will eventually use them against us. I have a great dislike for professional politicians of any party and I would like to see an overhaul from the top down. The number one rule of war is that you can not fight a war with only a part of the people. You have to go to war against a nation. When that nation is in a civil war you just have to back up and let them fight it out unless they spill over into the country of an ally. Now if you will excuse me I am going to get off this soapbox before I fall or someone knocks me off. It seems as if when they love us for showing up they end up hating us in the end. You captured the *duh* look of Kerry so well. Great caricature! There is definitely a lot of stumbling going on. Upside down he kind of looks like a mountain. Binky but the snow would be on the bottom. Politicians are always good at changing their minds to suit public whim. They change their minds more often that you change your underwear. We’d better not go there. You totally nailed Kerry’s likeness, Bearman… except… not windsurfing?! 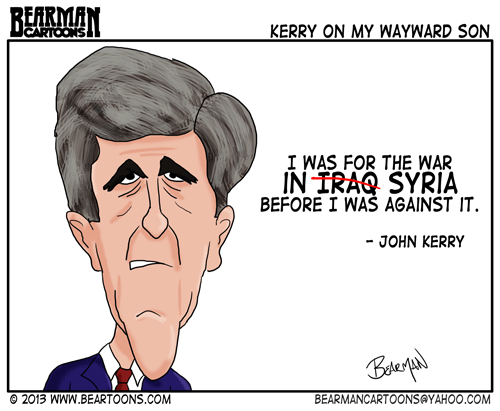 Kerry never looked better, Bearman! Thanks Mark. Which is good for me and not so good for him. Hey Bearman, long time since I stopped by. But wanted to say I love the site redesign and hope you are doing well. Thanks Rents Textbooks….OH WAIT, you aren’t hidden by that name anymore!! Great title. Just about every single politician in this mess is a wayward son indeed. The founding fathers would have given them a good spanking. Thanks. No, the founding fathers used whips. Money should go towards education and empowerment, not lies, snooping and destruction. My take on this is that both parties: dems and reps are corrupt. And that is why I make fun of both sides.